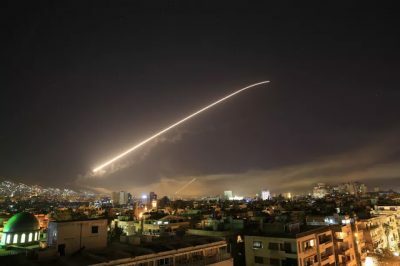 On 13 April 2018 the United States, the United Kingdom and France carried out military strikes against Syrian government positions. This was claimed by the United States Government and its allies, including Australia, to be in response to the use of chemical weapons by Syrian government forces in the Douma region close to Damascus on 7 April 2018. There are two elements relating to this attack that are especially noteworthy. The first is that the United States and its allies have made statements and now conducted military operations on two assumptions. First, that there was in fact a chemical attack carried out in Douma. Secondly, forces allied to the Syrian government of Bashar al Assad carried out that such an attack. Neither of these assumptions has been demonstrated to actually be true. This evidence has not been produced. Instead, we are told that it is “classified.” This is an unacceptable justification for an armed attack on a sovereign nation. Assertions are not evidence. One has only to recall the equally confident assertions made by George Bush, Tony Blair, John Howard and the minions about Iraq’s “weapons of mass destruction” to know that such assertions are frequently baseless and are more accurately described as lies to justify a wider geopolitical agenda. In the present case there are additional grounds to doubt the veracity of the claims made by Trump, May and Macron. Immediately following the alleged chemical attack, multiple reports emerged that the “victims” were in fact killed when a building collapsed. This was independently confirmed by eyewitnesses and hospital staff where the injured were treated. Unlike many Western media reports the persons interviewed were willing to be named. The hospital staff in particular were quite explicit: the persons admitted to hospital showed none of the symptoms of a chemical attack. Even the normally anti-Syrian government Syrian Observatory for Human Rights, a British based mouthpiece for MI6, spoke only of victims from a collapsed building. In addition, the Russian government immediately sent in specialists to analyze the area where the attack was alleged to have occurred. They reported that there was zero evidence of the use of chemical or biological substances, including in or on the alleged victims. The western media, where they did not ignore the Russian evidence, were dismissive of it on the basis of its alleged partiality. That may be an arguable point, but the Russians had already countered it by an invitation to the 0PCW to send a technical team to investigate. The Russians guaranteed their protection. At the time of the American led attack the 0PCW team had an effect arrived in Syria and had commenced their investigation. Completely missing from the statements made by the US, UK, French and Australian governments was any explanation as to why it was necessary to “send an unequivocal message” to the Syrian government and its Russian and Iranian supporters, before the OPCW had the chance to complete its investigations and issue a report. No doubts, no questions and no qualifying terminology. Why bother with evidence when the outcome is predetermined. Turnbull and Bishop, like their counterparts among other members of the US led “coalition” simply treat the matter as “case closed.” That this approach defies the most basic precepts of law is especially egregious coming from two political leaders who never tire of reminding the world of their commitment to the “rules based international order.” For them, it is a case of one set of rules for some, but a different set of rules for the designated enemies. The second aspect is one that is constantly ignored by those engaged in the demonization of Syria and its principal backers Russia and Iran. That is, an attack by one State upon another is directly contrary to international law, except in two restricted circumstances. The first exception is that such an action must be authorised by the Security Council. That has not happened. The second exception is that an attack is permitted, in limited circumstances, pursuant to Article 51 of the UN Charter when the attacked State can invoke self-defence. The opposition Labour party did not dissent from this view. This statement by Turnbull and Bishop is clearly intended to imply that the attacks come within the provisions of Article 51, though even they did not have the chutzpah to make that claim explicit. It is in any case in the context of this attack complete legal nonsense. None of these political leaders sought to justify their actions under international law. It is notable that they did not even try. None of this should come as a surprise. The latest attack on Syria had no more legal justification than Reagan’s bombing of Tripoli and Benghazi 10 days after a terrorist bombing in Berlin. There was a similar lack of any legal justification when Clinton bombed Baghdad in 1993 and 1996. Clinton also ordered an attack on what the Americans alleged was a chemical weapons related facility producing VX nerve gas in Sudan. That target turned out to be an ordinary pharmaceutical factory. The justification offered for the latest attack also repeats the long discredited allegation that the Syrian government was responsible for the chemical weapons attack in Khan Sheikhoun last year. It is a measure of the hypocrisy surrounding the latest attack that the evidence established in respect of the Khan Sheikhoun incident should be completely ignored. The mainstream media are complicit for their part in the continuing demonization of the Syrian government by also completely ignoring the relevant evidence. Rather than being an upholder of the “rules based international order” the United States is, rather, a serial violator of international law. Its self-description as the “exceptional nation” apparently extends to a belief that it is exempt from the normal rules of civilized discourse and behaviour between nations. At the time of writing the Russian response to this outrage is not known, but given the recent explicit warnings of Foreign Minister Lavrov and military chief Gerasimov, a response is both inevitable and necessary. To not hold the United States and its allies accountable for this blatant breach of international law will be ultimately more dangerous than taking no action at all.